I don't know if Windows regenerates them on reboot if you delete them or not. Those are part of Windows. The room they occupy is inconsequential unless your hard drive is full. You need 15% free space to do a defrag, and you obviously have that much or more. Look to see how much free hard drive space you have. Click on My Computer. Right-Click on your C drive and select Properties on the popup menu. On the General tab, it will tell you how much Used space and Free space you have, as well as your total hard drive capacity. If your computer ain't broke, don't fix it. I've got 15.0 GB Used Space, and 16.6 GB Free Space. You know as well as I do my computer is always "Broke"! BTW, did you ever find out how to prevent my Icon balloons from sometimes hiding behind, or below the task bar at the bottom of screen? It's very annoying when that happens. Thanks. Don't worry about your hard drive space until the Free space gets down to below 6GB. 1. Right[-click on the taskbar in an empty area and select Properties. 2. In the Taskbar and Start Menu Window that appears, on the Taskbar tab uncheck the “Keep taskbar on top of other windows” and click Apply and then Ok.
3. Then go back to the Taskbar and Start Menu Window (Step 1) and re-check this setting, click Apply, then Ok. This is supposed to refresh Windows little pecking order and should keep your tooltips on top of the toolbar, at least for the remainder of your current session on the computer. I've never seen this problem before, but it appears to be a common one with XP. I found these 2 pics in "My Pictures", & was wondering why they appeared in "My Pictures",, & what is their meaning. The first image is the picture in "My Pictures" shown to the right of the screen shot and Entitled "Thumbs", in "My Pictures. This second shot is next to it in "My Pictures" and Entitled "Desktop" there, and is something to do with Wordpad. These should not show up in "My Pictures" on their own, should they? Those are "hidden" system files and they belong there. Leave them alone. They are showing because I had you to show hidden files and folders while we were trying to fix the problems you were having and I needed to see that information in some of your screenshots. To hide them, Click My Computer > Tools > Folder Options. Select the View tab. Click on the circle beside "Do not show hidden files and folders (puts a period in the little circle beside the text). Click Ok.
Last nite when I tried to log on just before shutting off computer for the night, I was unable to log on. The system said low resources again. I had to hold the On button in so I could turn off the computer. I had forgotten about this, & I assume that you did also. 1) What do you think I need to do about this? 2) Is there a keyboard solution that will turn off the computer, when the Mouse will not work, as in a case like this? 2. Go to the Resolution section in the microsoft article where it says "Fix it for me". Click on the "Fix it" button. 3. Click "Run" in the File Download dialog box, and follow the steps in the Fix it wizard. See if this fixes your problem. 1. Reboot your computer: Press the Win Key (the one between Ctrl and Alt on the lower left of your keyboard) and release it. Press the U key and release it. Press the R key and release it. Your system will reboot. 2. Shutdown your computer: Press the Win Key (the one between Ctrl and Alt on the lower left of your keyboard) and release it. Press the U key and release it. Press the U key again and release it. Your system will shutdown. I went to the link and did the fix it for me. I set a restore point, but, I saw that microsoft set one also. I hope that does the trick. 1) I used IE to do the Microsoft Fix it thing. Could I have done it using FireFox as well? 2) I did some scans today, malwarebytes, superantispyware, & Avast boot-time scan. all were clean, nothing found. Do I need to check mark the "PUPs" box in Avast again,because it is still unchecked? 3) A Java question while I'm thinking about it. At one time, before the wipe & reload you had mentioned something about getting Sun Java. I hope my Java that I have now is good, but, thought I'd ask to be sure? If not, we'll try increasing your virtual memory page size next. Hopefully, that fixed it. Probably should for the boot time scan. The defaults on the other stuff should be fine. Should be - post a screenshot of your Add/Remove programs where the Java entry is so I can check it. You have the right java, but not the latest update. You should get it. Click on the Java Icon in the Control Panel and on the Update tab click on the Update now button near the bottom right and follow the installation instructions. 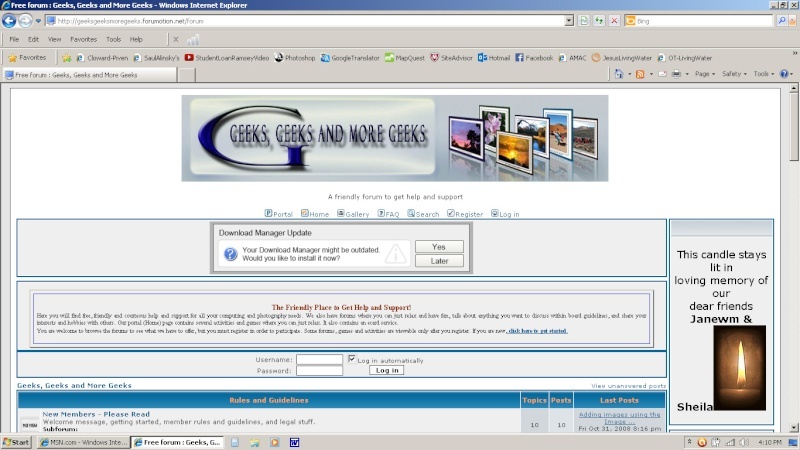 Be sure not to accept any offer downloads of other software should they appear during the installation process. Make sure on that update tab that you have it set to do updates automatically, but to ask you before installing. My Java doesn't have the "Update Tab" as shown below. After clicking all tabs Update was not found there. 3. The File Download dialog box appears prompting you to run or save the download file. Click Save to download the file to your local system. Save the file to a known location on your computer, for example, to your desktop or My Downloads. 4. Close all applications running that you have opened, including the browser. 6. follow the installation wizard instructions to complete the installation. 1) I installed Java. When I went for the Test It, I got an Error message, but it is working the pop up window said. I looked at the Instructions before installation, & I thought I would be offered the 3rd. party products, but it was not offered. I'm gonna post a screen shot I made, it says Updates will be automatically downloaded, to change this go to the link that's shown. That's what I wanted you to see. 2) You didn't mentioned going to Add/Remove before installing, to remove old one, so I didn't. Do I need to do that? I saw at the Java website that there was a "Remove Older Versions" place that I could click, but didn't. You can tell me if I need to do something? 3) Do I need to go and do the Updates Tab, that you mentioned before? and see that your Java Control Panel looks like the figures shown on this webpage and has the Update tab. It should be set to Notify Me "before downloading" and the box checked to "Check for Updates Automatically". That is the default option. You don't need to worry about other settings. If your Java (TM) 6 Update 23 is still in Add/Remove Programs, you can remove it. Be sure to set a new restore point before you do. Do the Test Java again to make sure it is still working ok. Future updates of Java are supposed to replace the previous version, so you shouldn't have to do it again. Automatically". That's the way I found it set. If your Java (TM) 6 Update 23 is still in Add/Remove Programs, you can remove it. It musta got removed when new version was installed, because it was gone. All that remains is Java Web Start, and Java(TM)6 Update 29. Why does this always happen to me? I forgot to test java until I had typed the first 2 paragraphs, and went to try the test. Following is the screen shot of what happened. These screen shots may not show up, maybe due to the java, because the host an image was not behaving correctly. Okay, this is an edit. I managed to get all 3 of my screen shots posted now. Maybe you can tell me what happened? On the screen you will see a box in the middle of the screen with Speed Test in the upper left, and a Start button in the lower middle. If you see this and can run the speed test you should be ok. Note: If you have NoScript installed in your firefox browser, you will need to allow dslreports.com in order for the box to show the Start button and run the speed test. I tried the test in Owner and I must not have no script enabled in it. There's the Java Icon in systems Tray. When these errors popped up the other day, I went ahead and ran everything in the tests, despite the Error warnings, and it told me that Java was working. Here's more screen shots. This is EDIT: As you can see in the pics below, when I tried to run the tests just now, this is what popped up. Let me try in IE and see what happens. NOTE: After the first test in FF, I went back to try test again, & the box was a blank this time. I'll post after trying IE. Here's screen shots. I'm in Owner account, and need to report that in the Owner account I am still getting the IE 8 questions that it asks when I first installed the IE8 program. I've answered that on several different occassions already. Here's another EDIT at 11:22 AM central time. Repa, It's been about 10 minutes since I posted this last scr. shot, so I hope you see this in time. I was just thinking that I wonder if I need to restore back to before this Java install started, because I've noticed the computer exhibiting some odd behavior since this New Java install all began.. Your thoughts? WC, I don't have a clue why this is happening. I cannot reproduce anything like this on my computers. Problems with digital signatures usually indicate either the publisher's certificate is out of date, or your Windows and IE updates aren't current. Are your Windows updates current? Click No to "block potentially unsafe components to run" to run in the IE browser will fix that problem. There is no danger to your computer in letting the speed test run. In the Firefox browser, check the "always trust content from this publisher" and click run on the error message you get from the speed test. 1. Go to the Control Panel > Java Control Panel > Advanced > Security. 3. Select the option that says "Enable - hide warning and run with protections." I don't know why you keep getting the questions about IE8. If it annoys you, uninstall IE8 and reinstall it from Windows Update, being sure to be in the owner account when you install and first run it, and go through all the questions to the end of the Setup Wizard that is prompting you with those questions. 1) Are your Windows updates current? I have the Automatic Updates turned on, so wouldn't they have to be up to date? 2) In the Firefox browser when I go to try the dslreports test, all that is on that webpage is the blank box where the test button is supposed to be. So, I can't even try to run the speed test. 3) In the Firefox browser, check the "always trust content from this publisher" and click run on the error message you get from the speed test. I'll try this after this post. Edit: I just remembered I can't try the test, when I go to dslreports speed test there's only a blank box there. 4) I don't know why you keep getting the questions about IE8. I don't either. I went through all the IE8 Setup Wizard questions, on each account, right after installing IE8, and when in the Owner account, it is the only one that still keeps bringing up the IE8 Set up Wizard questions each time the IE browser is opened. The only time I use IE in the Owner account is to make a post here with screen shots, mostly. So, I just close the Wizard window, & keep going, so, I'd rather do that, than go to the trouble of Uninstalling IE8, & doing a re-install. 5) So, you do not think going back to before the new Java Install Restore Point is necessary? And, do you think that my Java is working as it is supposed to? I don't know what you've done that you don't get what you did before when the error message popped up. You should get the same results as before. Something in the registry must have changed. Restore back to before doing the java update. If you don't have any problems in firefox after restoring back to before you did the java update, then leave java alone and work with the older version. 1.Set a new restore point. 2. click Start > run > type regedit and click ok.
5. If any of them are of any value other than 1, double-click on the name and change the value to 1 in the popup that appears, and click ok.
Uninstall and reinstall IE8 unless you want to live with it as it is. A friend died, and funeral and all, all I had a chance to do was Restore back before the Java Update thus far. As soon as I try the Registry instructions from your last post, I'll reply back here. Also, have some more to add, and I'll post it all at the same time.